The Omega HEPA (High Efficiency Particulate Air) CERTIFIED System [VACOHCS] is a great immediate containment option for hazardous particulate applications. This CERTIFIED system features a HEPA filter that has been individually tested and HEPA CERTIFIED to EN 1822. The CERTIFIED HEPA filter is also supplied with a test certificate that verifies matching serial numbers, date and efficiency. This CERTIFIED HEPA vacuum has three levels of filtration, self-storage and contained accessories, 1,000 hour rated Ametek Advantek II motor and 25’ detachable power cord. The CERTIFIED one-gallon HEPA filter has 3 layers of 56 pleat media. The three layers consist of one cellulose layer and two glass layers. The CERTIFIED HEPA filter captures everything from hazardous particulate to lead paint dust/chips-RRP (Renovation, Repair and Painting), cement dust, silica dust, engineered stone, mold, etc. 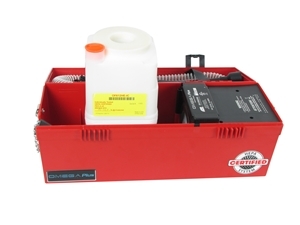 The Omega CERTIFIED system also comes with a heavy-duty retention plug and chain for permanent maximum spill and leak protection when transporting or storing. 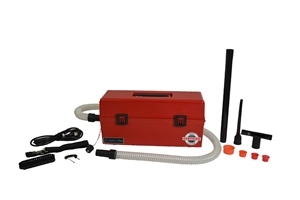 The tool box structure and self-contained accessories makes this vacuum convenient for mobile technicians.